We've changed how members can arrange the fields in their catalog, converting the former menu method to a drag and drop method. Your old fields should have carried through, unless you made changes in the last hour or so. Questions? Comments? Improvements? Bugs? If members have problems with it, please let us know exactly what browser and OS you are using, and, if possible, the exact version of the browser. Kudos to Ammar for most of this! This is amazing, thank you! And the classification of the fields on the right is really helpful. Very sharp, hope to play with it over the weekend. My books per page says 100, but I am getting 50. It stays at 50 no matter what I change it to. I'm also seeing 50 books per page, with my settings at 20, where they've been since forever. Mac OSX 10.9.5, current version of Chrome (Version 41.0.2272.101, says About). >6 MarthaJeanne: & >7 lorax: Also seeing 50 - have 200 selected. Just to add to the confusion on this, my settings have always been at 50. However, when I actually *look* at the settings for this, it says it's at 20. Since changing the settings on that page has never interested me, I have looked at it rarely (other than out of curiosity when someone else has been having issues with their own settings). I just saved it, and it remains unchanged. It still *says* 20, and still *shows* 50. When I put it at 50, and then saved it, it kept the 50 setting. I also note that when I saved it first time (where it was set at 20), it did not return me to the catalog view, but stayed in the "Settings" mode (I hadn't actually changed anything). I was unable to replicate this, and it now returns to the catalog view correctly. I mention only because it was odd. It also changed the fields of the style I was using. Luckily the drag and drop worked in Firefox, because it doesn't in Safari on my iPad. For people browsing primarily or exclusively on a mobile device, it seems like a reasonable option to allow them to see a page without scrolling, and it costs nothing to have it available. My books per page setting says 20, but I am getting 50 and can't do anything to make it otherwise. I think we will be able to get it working on iPad/mobile devices. This happened to me to a while back. There's a previous thread that reported most of these issues back in February here: http://www.librarything.com/topic/188081. Thank you for the new feature!! P.S. Same as others reported above - I've had my settings to show 200, still shows button selected as 200, but it's only displaying 50. Ok, sorry about that little mishap. The correct number of books should now be shown according to your settings. I love this! I've already changed things a few times and I'm sure I'll change them all a few more time until I get them the way I like, but it's so easy to do. Thank you! Very cool! Looking forward to playing with it. Ok, it should now be working on mobile/tablet devices. Unfortunately, I don't have an iPad(or the million other devices) handy to test on. Let me know if you experience any further issues. Tried it on my iPad, and seems to work well. Very nice! Works well on OS Chrome, with Chrome browser. I have only one possible issue . . . I can't tell just by looking how many of the 14 spots I'm using in each style. I have to count . . . or move and then see if there's room. Is there any way to indicate how many open spots are available for each style? Otherwise . . . love it, love it, love it! One of my styles ends with Dewey, LCC, Dewey Wording (an order I can't believe I would have chosen, but even if I did needs to be changed). I keep trying to move Dewey Wording next to Dewey and/or move LCC before both of the Deweys, but when I hit Save it the changes don't stick. Update: I tried removing Dewey Wording altogether. I get a confirmation box, but then it puts it back in anyway. Mine refuses to work and I lost my previously saved layouts. I've tried several times to arrange the styles in the order I want, and it says my changes have been saved, but nothing changes when I return to the 'my books' page. The lending, classification, etc. that I added are not showing up and it still shows 50 books at a time instead of the 20 I set it for. I can drag and change the order of styles but when I hit save they all revert back to the default settings. I lost my preferred setting for visitors as well. I tried using IE 11's latest version with the same results. Please correct this glitch asap please. Yes, further experimentation here and none of my changes are saving. I think the styles listed are those I used to use (though I can't be sure), but I'm not able to make any changes. Something got reverted. Fix soon. Sorry. We had to transfer nearly 2 million styles from one format to the other. This couldn't be done instantly. So if you made changes in the hours immediately before the switchover, you have to redo them. Nice, thanks, that we can arrange it personel now! Thanks for fixing the save style however, I am unable to set my default style for visitors. My custom style A is saved but does not show for visitors when selected. One little glitch. See my post #27 for OS and browser. Right, that is the next step we are working on. I believe by Monday there should be a fix. Holy Cow! Love this! I just went in and played with everything. I've never bothered to set or use the different styles, not understanding it much, but this is very clear and easy to figure out. Now I will be using each style I have set for quick access to information on my books. Thank you! If a revision is made to label the slots for ease of reference, I'd also suggest the ability to label each style. I use them for different things and often forget if it's A or B. But obviously not a big deal to switch between them, without labels. >44 elenchus: Labels would be good. I have all the Dates in D and all the Entry information in E, which makes those two easy to remember. The problem with labels is that they might not fit on the screen. Hence each is only one letter long. >46 timspalding: What about putting the labels as hovertext, or would that not work for something that dynamic? I know hovertext doesn't work on mobile devices, but it could be a start. I just don't see that much of a gain. The styles-editing interface would get more complex, and for minimal gain. There used to be a brightcopy add-on that enabled labels. But I guess it stopped working, too. I don't need labels for the styles or the slots, just some way of counting how many fields are used (or free) in each style. The old format had X dropdowns so you could see how many free slots were available in a style. In the new method the fields are different sizes so difficult to get a count with just a look. I was thinking of something like "(x fields free)" next to the Style ABCDE name. >49 Collectorator: It stopped working, indeed. I see that approach working, but also do-able would be simply to "label" the empty slots, so you could easily see them despite the varying size of fields already dropped in. It would require the empty slots also be labeled, though, and probably not happening. The max is currently 14. If you want more, we can add more. But 14 is a heck of a lot. >54 timspalding: Tim, did you forget how to indicate which post you are responding to? Did someone in the 54 posts above ask for more fields to be displayed in the catalog? If so I missed it. He was responding to LucindaLibri requesting a way to see how many slots were free, by saying "you shouldn't have to care, 14 is a lot." Right. If you want 20, we can do 20. But I can't imagine 20 is going to be anything but a problem on anyone's computer. I'm also having issues with getting the visitors display style to stick! I can change my display style ok, but when I set it to visitors style B and 20 books it saves, but when I view the catalogue from visitor mode it seems to revert back to some sort of default setting. I have tried IE9 Windows 7, FF 36.0.4/Windows 7 and Chrome/Windows 7 -all with the same results! Any suggestions? Hi, this shows up when I log in, but my selected style is not showing up on my public catalogue. It is defaulting to a minimalist style of Title/Author/Date/Tags/Rating/Entry Date. My style is not showing up on my public catalogue in either IE 9/Windows 7, or Chrome 41.0.2272.101/Windows 7. >59 METIER3: and >60 SLALS-VUW: timspalding was making more changes to the default style. Can you check to see if you're still having issues today? Following on the revamp of how styles are picked and moved around, we've revamped "Default style for visitors." See the thread at https://www.librarything.com/topic/189264! Problem should be fixed. Let me know if any issues persist. >62 timspalding: The settings do not work for me with Win/IE10. The latest Chrome does work, thank you. Thank you, the visitors catalogue style is now back - just in time for a demonstration I had planned to give today showing people how to use it! >65 timspalding: Display styles https://www.librarything.com/settings/styles. My work around was using Chrome instead of IE. I love the drag and drop! Okay, what part of that doesn't work? What version of IE? We tested IE extensively, so I need to know so we can narrow this down. Why is what I said so easily and repeatedly misunderstood? I don't want/need more fields (though I tend to use them all), I'm just telling you that the new method makes it difficult to tell how many you have used and how many are left. The old method had a fixed number of fields spaced evenly across the style settings page, some or all of which could be left blank. Now blank is not an option (as far as I can tell) and there is no easy way to sense how many fields you have used. Seems to me that would be a useful thing to be able to do . . . especially given that no one who hasn't read the original description of the 14 fields is going to just "know" how many fields are possible in a given style. Visitors display style is now working - thanks! >67 timspalding: I just tried again with IE Version:10.0.9200.16721 Update Version 10.0.10. When I save anything, it wipes out all the settings I did in Chrome and defaults to a very basic display. Maybe I need to update something with this version of IE? >68 LucindaLibri: I think the point was that you should have no need to know that, because there should always be more room for columns than you'd want to use. So if you're pushing the limit at 14, Tim might prefer just to increase it to 17 or something rather than add another UI element. Or to put it another way, it sounds like Tim thinks that 14 fields is more than anyone would want so there's no need for you to know how many are left. >68 LucindaLibri: You said, "Why is what I said so easily and repeatedly misunderstood?" That could be my signature around here. I just expect it now. FWIW, when I was re-arranging, I kept thinking how it would be nice to see how many I had used in each style and how many I had left to go, because, you are right, in the old grid it was simple to see. It is true that you can no longer easily tell how many fields you have used. We are all saying that because "14 fields should be enough for anyone" there is little reason to care how many you have left; put in as many as you want. There aren't blank spots as placeholders, but there's no reason you need to use all 14, or have all of your styles have the same number of fields; is that the root of the misunderstanding? That you had thought you were required to use all 14 fields in all styles? So, I can see wanting to know how many fields you used if fields took up the same amount of room. But there's considerable variation, depending on their contents. So you might be just fine with 15 fields if the were all volume counts and ratings. But 5 would be too much if they were all long reviews, long comments and etc. Just realized the brightcopy script IS still working on my laptop. I don't remember how to edit, though. Does anyone? I need to change Everyone to Extra. But it is not a big deal. As I recall, when you go to the Settings page with the script running, there are fields at/next to the letters on the left for typing in the new names. Don't know if that will still work on the new Settings page, though - my script stopped working a long time ago. It should be working in IE now. >78 LT_Ammar: Yes, it's working! Thank you. I give up about the UI for the number of fields. My issue is NOT with how the fields display in the book listings, my issue is (once again) with the UI for the settings. So now I just have to put up with the pop up telling me I'm using too many fields . . . which apparently I do. So please stop saying "no one should need more than 14". Today I need to compare bookIDs and WorkIDs for several items. I can't find those "fields" anywhere on the list of bubbles (which are getting annoying to page through and don't seem to be arranged in any particular order, so I would now rather have just one list of all the possible fields). I don't think they've ever shown up in the catalog - so yeah, URL or export. And I don't think WorkID exports...though I haven't thoroughly explored the new JSON export. Oh, I'm sorry, I should have realized that my allusion was perhaps too obscure for a general audience. The specific phrasing I used was a reference to Bill Gates' notorious statement that "640 K of memory should be enough for anybody", and was meant to imply that Tim's assumption that nobody would ever want more than N fields was perhaps not correct. Tim said he'd be willing to add more if you want, though, so how many more fields would you need to add? 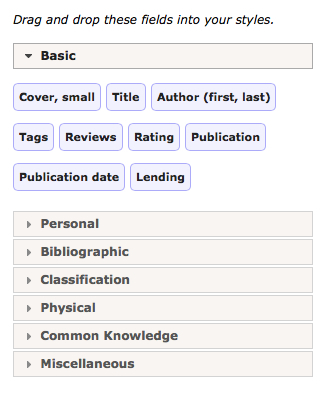 We can add book id and work id, but no, I don't think they've ever been exposed in the catalog. Problem turned out to be something else . . . used paper and pen to write down work and book ids . . . but the problem was actually close author names and bad power editing . . . but I'm in the "give me as much data as possible" camp . . . I had to do a data dump and found an empty field instead of the last parameter that should have been passed, which gave the essential clue. I think 14 fields per style is more than enough (sometimes they really get squished up if there is a lot of text, like in comments and reviews). However, I would love to have more than 5 styles available, because when I am doing "batch" editing of a lot of records for certain fields, for which I use style E, I have to keep changing the field layout. It would be nice to have more so I could keep the frequently used "formats" among my styles. I would like more than five styles too.